Show pride for your favourite team with the LA Galaxy 2015 away jersey. Styled in navy blue with subtle pattern on the front and stripes on the sleeves, this LAВ Galaxy top has a stand out look. Built with ClimaCool fabric, this jersey will keep you cool and comfortable as you train. Styled with an embroidered adidas logo and LA Galaxy team crest, you can show LAВ Galaxy pride when you wear this away shirt. 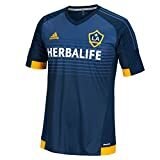 This entry was posted in Soccer and tagged 20152016, Adidas, Away, Football, Galaxy, Gents, Jersey, Mens, Shirt, Soccer by FPSports. Bookmark the permalink.